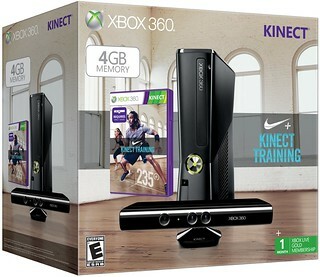 The Xbox 360 Nike+ Kinect Training Bundle includes a 4G Xbox 360 console, Kinect sensor, a copy of “Nike+ Kinect Training” and a one-month Xbox LIVE Gold membership for $249.99*. Available at major U.S. retailers while supplies last. “Nike+ Kinect Training” will be available for Download on Xbox LIVE Dec. 25. You can skip the post-holiday shopping crowds and download the full version of “Nike+ Kinect Training” directly to your Xbox 360. Available through the Xbox LIVE Marketplace beginning Dec. 25 for $49.99/4,000 MS points. The “Fast and Focused: Upper Body and Core Pack” is a 15-minute workout with personalized drills to target your upper body while burning calories. This add-on content integrates with your ongoing “Nike+ Kinect Training” program, adding new, challenging drills as you progress through your workout. Available through the Xbox LIVE Marketplace beginning Dec. 26 for $4.99/400 MS points. * Estimated retail price. $50.00 off Holiday Price Promotion ends Jan. 5.